Your Rights in the Workplace is an invaluable reference for every employee. Whether you have questions about your paycheck, discrimination, layoffs, or benefits, you'll find answers here. unemployment, disability and workers' compensation insurance. Your Rights in the Workplace also contains nearly 20 charts on state-specific employment laws, including those on equal pay, use of criminal records, paid sick leave, social media passwords, medical and recreational marijuana, and more. You weren’t hired for a job and you have good reason to suspect it was because of your race or your disability. Your employer promoted a less-qualified person to fill a position you were promised. You want to know your legal rights if you consistently work overtime, you want to take leave to care for a sick parent, or you are called to serve on a jury. You have just been laid off and you’re wondering if you have the right to get your job back, to get unemployment payments, or to get severance pay. You want help evaluating a new job you’ve been offered. Or you want to find out your legal rights as a jobseeker. This book will help you understand the legal rights that apply to your situation. It explains federal workplace laws, such as those guaranteeing your rights to be paid fairly and on time and to work free from discrimination. It also explains the many state laws that affect your workplace rights, which are often more generous to employees than federal law. Several cities have their own laws as well; however, they are too numerous to include in this book. Contact your local government to learn about these laws, especially if you live in a large metropolitan area. You are entitled to the protections of whichever law is the most beneficial to you. This book explains the laws that apply to private employers. Many of these laws also apply to government employees. However, there are several areas where government employees have different rights than private employees; these laws are not covered by this book. While some might prefer to read this book cover to cover, we have also designed it so that you can flip to a particular chapter and quickly find the answer to your questions. For situations that are fact-specific or complex, we also point out where it would be wise to consult with a lawyer. Also, be aware that there are many public and private agencies, groups, and organizations that specialize in workplace issues, and many of them provide free—or low-cost—counseling, support, or referrals. You will find information on these organizations peppered throughout the book and in a comprehensive listing in the appendix. If you think your employer is breaking the law, it’s natural to feel angry and want to sue. However, in most cases, immediately running to the courthouse is a bad idea. Although lawsuits are necessary in some cases, they can be costly and time-consuming. And, in some cases, the law actually requires you to notify your employer of a problem or take other action before filing a lawsuit. The better course of action is to know your rights, try to work it out with your employer, gather documentation, and then consult with a lawyer about taking legal action. Don’t overlook the obvious: First, try talking over your workplace problem with your employer. An intelligent discussion can resolve many wrongs, or at least get your differences out on the table. Most companies want to stay within the law and avoid legal tangles. So, the odds are that your problem is the result of an oversight, a misunderstanding, or a lack of legal knowledge. Here are a few tips on how to present your concerns to your employer or former employer. Know your rights. The more you know about your legal rights in the workplace—to be paid fairly and on time, to do your job free from discrimination and retaliation, to work in a safe and healthy place—the more confident you will be in presenting your problem. 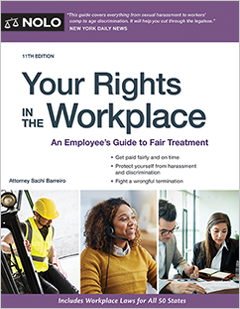 This book offers a wealth of information about the basic laws of the workplace, and tells you where to turn if you need more specific information to clarify your rights. Also, the book contains a number of charts summarizing state laws on various workplace rights, including specific penalties that may be imposed on employers that violate them. It’s probably not worth it to sue your employer over a violation of a law requiring paid time off for voting or for a single miscalculation of overtime pay. But knowing whether a particular transgression can be punished with a fine, a criminal conviction, or an order to rehire you is the kind of information that can make your employer take your complaint more seriously in the bargaining process. Stick to the facts. Keeping your legal rights firmly in mind, write a brief summary of what has gone wrong and your recommendation for resolving the problem. It often helps to have someone who is more objective than you are, such as a friend or family member, review the facts of your workplace problem with you and discuss possible approaches to resolving it. Check the facts again. The human memory is not nearly as accurate as we like to think it is, particularly when it comes to remembering numbers and dates. Before you approach your employer with a complaint about your pay, check to be sure your math is correct. If your beef is about a discriminatory remark, do your best to quote it verbatim. Review all of your written records to make sure you haven’t overlooked a past event or pivotal memo. Don’t be overly emotional. Recognize that dealing with a workplace problem can be stressful. After all, if you are like most workers, you spend about half of your waking hours on the job. Or you may be out of work and having a hard time finding a new job. Acknowledge that these pressures of time and money can make it more difficult to deal with a workplace problem. Then vow to proceed as calmly and rationally as possible. Stay on the job if possible. If your job is on shaky ground, try not to jeopardize it further by losing your temper and getting fired as a result. A calm presentation of a complaint is always better than an emotional confrontation. Remember the common wisdom that it is easier to find a new job while you still have your old one. At the very least, it’s easier to blaze a new career trail if you leave no muddy tracks behind you. And, in some cases, you won’t be eligible for unemployment if you’re fired or quit your job. Be discreet. Discussions of workplace problems are often very personal and should take place privately, not in front of clients, customers, or coworkers. Employment problems can be divisive not only for those involved, but for an entire workplace. You don’t want to be accused of poisoning the workplace for your own gain. Ask for an appointment to discuss your complaint privately with your supervisor or another appropriate manager. If you give that person a chance to resolve your problem rationally and privately, he or she will be more apt to see things your way. However, if your workplace complaint affects your coworkers, you have every right to discuss the issue with them and work together to try to get changes made. Most employers now embrace the workplace mantra reinforced by thousands of court cases: Document, document, document. If your good working situation has gone bad—or you have recently been fired—you, too, must heed the call. Make a written record of everything that happened, with dates and other important facts. You will have little ground to stand on if you don’t have any evidence of your employer’s wrongdoing. A little bit of workplace paranoia may later prove to be a healthy thing. Even if everything seems fine now, take the extra time to create a paper trail. Collect in one place all documents you receive on the job: initial work agreements, employee handbooks, management memos, performance reviews. To be safe, keep your file at home, away from the office. If you have what seems to be a valid complaint, it is crucial to gather evidence to bolster your claim. From the start, beware of deadlines for filing specific types of legal claims. The deadlines may range from a few weeks to a few years but will likely signal that you have to act quickly. Don’t take confidential papers. While it’s true that you are in the best position to gather evidence while you are still working, be wary of what you take in hand. Confidential information, such as evidence of the company’s finances and other documents that the employer has clearly indicated should not be disclosed, are off limits. If you take these kinds of documents out of the workplace, that may actually become a legal ground for the company to fire you, or for a court to limit or deny your remedies for wrongful treatment you suffered while on the job. There are several kinds of evidence you should collect as soon as possible. Company policies. Statements of company policy, either written or verbal, including job descriptions, work rules, employee handbooks, notices, or anything else that either indicates or implies that the company is treating workers unfairly may be the most meaningful evidence you can amass. A straightforward company policy can also help bolster your case or complaint if you can show that the policy promised something the company didn’t deliver. Written statements by management. Statements by supervisors, personnel directors, or other managers about you or your work are also important. Save any written statements and emails, noting when and from whom you received them. If you have not received any written reasons for a job decision you feel is discriminatory or otherwise wrongful, make a written request for a statement of the company’s reasons. Performance reviews. Keep copies of your annual performance reviews and any positive feedback from customers, clients, or coworkers. If you think your employer has fired you for a discriminatory reason, evidence of your excellent performance record will be very helpful. People might be afraid they’ll lose their jobs or suffer in some other way if they pitch in. You may be able to persuade them to help you by reassuring them that the same law that prohibits the initial wrongful treatment also specifically prohibits the company or union from retaliating against anyone who helps in an investigation of your claim. However, if your attempts to coax coworkers are unsuccessful, respect their rights to remain mum; proceed with whatever other good evidence you can garner. Verbal comments. In many cases, employers and their managers do not write down their reasons for making an employment decision. In such cases, you may still be able to document your claim with evidence of verbal statements by supervisors or others concerning unwritten company policy or undocumented reasons for a particular action involving your job. Make accurate notes of what was said as soon as you can after the statement is made. Also note the time and place the statement was made, who else was present, and the conversation surrounding it. If others heard the statement, try to get them to write down their recollections and have them sign that statement. Or have them sign your written version of the statement, indicating that it accurately reflects what they heard. Wipe the dollar signs from your eyes. While it’s true that some workers have won multi-million dollar judgments against their employers, it’s also true that such judgments are very few and far between. There are several things to think about before you decide to launch a no-holds-barred legal challenge to your firing or wrongful workplace treatment. Evaluate your motives. First, answer one question honestly: What do you expect to gain by a lawsuit? Are you angry, seeking some revenge? Do you hope to teach your former employer a lesson? Do you just want to make your former employer squirm? None of these provides a strong basis on which to construct a lawsuit. If an apology, a letter of recommendation, or a clearing of your work record would make you feel whole again, negotiate first for those things. You will need good documentation. As this book stresses again and again, the success of your claim or lawsuit is likely to depend upon how well you can document the circumstances surrounding your workplace problem. If your employer claims you were fired because of incompetence, for example, make sure you can show otherwise by producing favorable written performance reviews issued shortly before you were fired. Before you discuss your case with a lawyer, look closely at your documentation and try to separate the aspects of your problem that you can prove from those you merely suspect. If you cannot produce any independent verification of your workplace problem, you will be in the untenable position of convincing a judge or jury to believe your word alone. Taking action will require time and effort. You can save yourself some time and possibly some grief by using this book to objectively analyze your job loss or problem. If possible, do it before you begin talking with a lawyer about handling your case. Once again, the keys to most successful wrongful discharge lawsuits are good documentation and organized preparation, both of which must come from you. Consider other legal options. Filing a lawsuit is not your only option for getting compensation. You can also file an administrative complaint with a federal or state agency for certain types of workplace violations, such as discrimination or harassment, wage and hour violations, and more. These proceedings can be shorter and more manageable to navigate. However, you might want to consult with a lawyer before initiating an administrative claim to make sure you’re on the right track.